Oh man, I think you have found your calling Steve. These signs are important historical documents. The misspellings (or did you re-arrange the letters, heh heh). I wonder how long ago Mayor Stranczek's ancestors were immigrants. 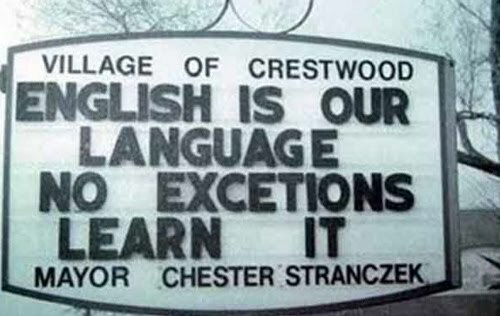 I try to imagine the feeling that a foreign tourist would have driving through Crestwood. Would he or she feel welcome? The real questions are, how did it come about that so many non-Americans ended up in Crestwood. Who hired them? Why? Did they care whether the people they hired were legal aliens? Why is this such a big issue right now in Crestwood?